I was tasked with discarding an old (1999) Zenith CRT television this week. The set worked perfectly but it’s bulky and gets no use today. Our primary TV is a Sony KD-34XBR970. It’s also a CRT but a Hi-Def model, and supposedly the last CRT manufactured by Sony. I love the picture quality on this and have not yet seen an LCD or plasma that can compare to it. I delivered the TV to the local GoodWill store and they refused to take it. “We’ll only take in TVs that were manufactured after the year 2000.” So, I travelled to another thrift store and, thank goodness, they willingly loaded the Zenith onto an old shopping cart and rolled it into the shop. Hope it finds a home! Thrift stores are terrific for finding interesting, old electronic stuff and “Value Village” was no exception. 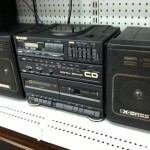 I spotted a Sharp GX-CD10 boombox in decent shape and 100% operational. 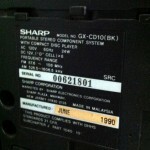 Take a look at the back of the radio–apparently by 1990, Sharp had already moved at least some of their manufacturing out of Japan and into Malaysia. 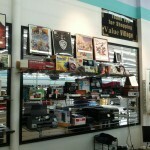 Up front and behind the main counter is where the store keeps its big-ticket stuff like artwork, jewelry, and apparently antique video game systems like the Sears-branded Intellivision, called the Super Video Arcade. I didn’t know Sears had sold a re-branded Mattel’s Intellivision, I knew they had done the same with the Atari 2600. This particular model looks different than Mattel’s system: note the white and dark brown color combination (as opposed to the gold and brown Intellivison) and the controller placement is different too. 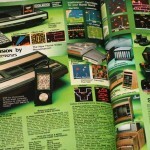 Did Sears actually redesign the console? The one I spotted is still in its original box. In 1982, this home game console cost just north of $200. Fifteen or so years ago, we were tripping over Atari 2600s, Odyssey IIs and the like in the general merchandise area of thrift shops, usually priced around five or ten bucks. 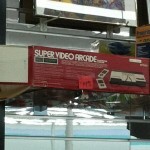 Times have changed because the Value Village Super Video Arcade is priced at $99.99! This entry was posted in Boombox Decline & Fall, Magical Gadgets by pocketcalculatorshow. Bookmark the permalink. Was the Sony KD-34XBR970 (CRT) manufactured in Westmoreland , PA?